When thousands of people walk a trade show floor, it is easy to be overlooked. But Beka Business Media’s conference and exhibit dailies help you get noticed. 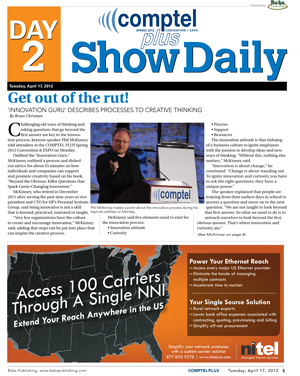 Designed to highlight products, services and demonstrations of exhibitors, Beka Business Media’s show dailies are distributed to inform attendees of who is making news at the show. Product updates, exhibitors’ press releases and company advertisements also help attendees cut through the clutter so they can better focus on the exhibitors that help them fill their needs. Beka Business Media’s dailies are produced by the same expert staff that brings you ChannelVision and InsideOutdoor magazines. For information on how to get your news and advertisements in any of the Beka Business Media conference and exhibit dailies, contact Berge Kaprelian at 480-503-0770 or berge@bekapublishing.com.